This looks interesting. 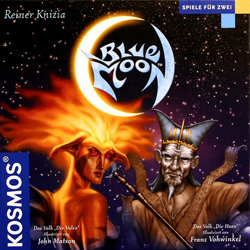 Pete Haselhurst mentions on his nimrods blogÂ about this free download of Blue Moon to allow you to play against a computer opponent. All eight races are included and the AI looks as though it could be quite tough as Pete reckons it beats him every time. With the Superbowl just a week away, On The Line Games have posted team sheets for the two teams and Chris and I set out to discover who was going to be lifting the trophy in Phoenix, Arizona on 3rd February. I hope the game turns out to be closer than our playing. Chris’s Patriots crushed my Giants in a very one sided affair. New England’s aerial attack was virtually unstoppable whereas New York’s offence just didn’t get started. At half time, the Patriots led by 31-3. The second half was a bit less embarrassing for the Giants and they did eventually get into the end zone. However, New England added another two TDs and a field goal to make the final score 48-10. This week there were five of us so I decided that it was time to break out Kingsburg, a game by new Italian designers, Andrea Chiarvesio and Luca Iennaco, and published in English by Elfinwerks. In Kingsburg players are governors sent from the King to oversee the territories at the edge of his realm. The game takes place over five years (rounds), and in every year there are 3 production seasons for collecting resources, building structures, and training troops. The final season of the year is winter, in which all the players must fight an invading army. During the production seasons, players role dice and allocate them to influence the advisers in the King’s Council. Good dice rolling skills help but the player with the lowest influence dice sum will be the first one to choose where to spend his/her influence. Once everyoneâ€™s dice have been allocated, the advisers award different resources or allocate soldiers, victory points or other advantages to the influencing player. Players then get the chance to spend resources on buildings that give a benefit of victory points and/or help in the later stages of the game. In winter, an enemy army appears and players use their troops if they have any to try and fight them off. Win and the king rewards you, lose and the enemy makes off with resources, VPs and/or destroys buildings. At the end of five years the player with the most VPs is the winner. In our game, Steve started out hot favourite having been the only one to have played before (3 times) with Mark G a close second favourite as it involved rolling dice. Due to my fantastic dice rolling skills, I was the only one unable to build in the first season, an insult compounded by the fact that everyone then immediately picked up a VP from the King for having most buildings. The allocation of dice is the most interesting part of the game as by careful placement, you can freeze others out of play. Steve suffered from this a couple of times early on, so much so that he announced early in the second round that he was positive he couldnâ€™t possibly recover from such a bad position. Yes, Steve, everyone fell for that old chestnut! Nige on the other hand honed in on what certainly seemed the most powerful building track (Inn, Market, Farms) and quickly gained himself an extra white die that proved extremely useful. Rolling 17 to influence the Queen? No problem with four dice! Mark G went down the military route and was never troubled in Winter and may have been a real contender if any of the invading hordes in the first four years had been intent on wrecking buildings. As it was, it was only in the final winter when something really horrible could happen. I wasnâ€™t too worried as we were facing demons and my Church added to my defence so I only needed two soldiers from the King to be safe and Mark G was rolling the die. However, Mark was already safe so declared that a 1 would be a good roll. Sure enough, his skill didnâ€™t desert him so I lost 9 VPs in that oh so harsh winter. Nigeâ€™s Farms meant that he had the game sewn up pretty easily a while before the end but the threat of â€œEven Nige couldnâ€™t lose it from hereâ€ meant that he took his time(!) to make sure of the win. 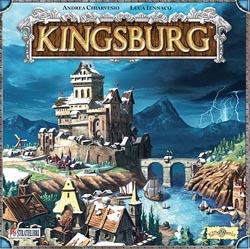 Kingsburg is excellent and hits just the right buttons for me. There are lots of ways to develop your capabilities and none of them can guarantee victory. A more demanding winter could have seen off Nigeâ€™s farm advantage and helped Mark G. Poor dice rolling doesnâ€™t help but there is normally something you can do with your dice and the help of the extra die in Spring and Kingâ€™s Envoy can help bring somebody who is trailing in buildings back into contention. All in all, a fine game and very nicely produced. A very strong contender for Game of the Month. 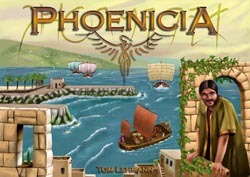 Phoenicia is a development of Outpost that retains the flavour of the original but plays much quicker. Lots of possible paths to follow to find a winning strategy and nicely produced by JKLM. 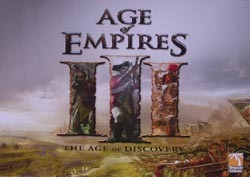 Age of Empires III is a brilliant game based on the computer game that is beautifully produced by Tropical Games. Again, plenty of different strategies to pursue and one of the few real gamersâ€™ games released this year that plays with six. 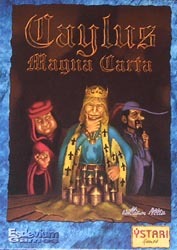 Caylus: Magna Carta takes the original highly rated board game, simplifies and shortens the game play to make it even better and presents it as a card game. Iâ€™m not sure I need to play the board game version again as the streamlining is superb, in much the same way as I prefer San Juan to Puerto Rico. 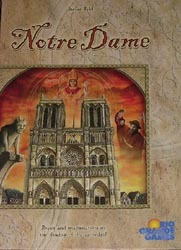 Notre Dame was Aleaâ€™s big release of 2007 and turned out to be another superb game. Lots to think about in this one with a nice card drafting mechanic where the cards you play are determined partly by you and partly by the player on your right. Also, the need to control your rat population gives an extra layer of tension. 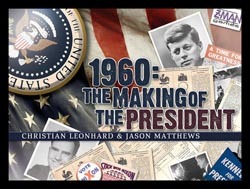 1960: The Making of the President is an excellent two player area control game. The cards do a great job of instilling atmosphere with the events portrayed and getting the balance between canvassing support in the states, controlling the media and gaining the upper hand in the key policy issues. 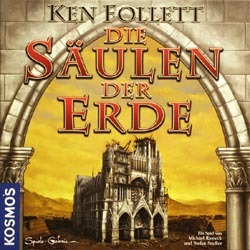 Pillars of the Earth was a worthy winner of the 2007 Deutsche Spiel Preis as it does a great job of translating Ken Follettâ€™s book into an engaging board game. Similar in style to the way Caylus plays, PotE succeeds in streamlining the number of choices to be made while leaving lots of tough decisions to be made. The next session of the Shrewsbury Boardgames Club will be on Friday 25th January at Garry’s house. 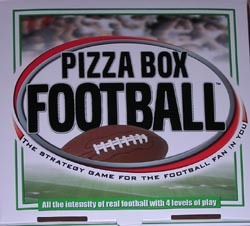 The winners of the Board Game Internet Awards for 2007 have just been announced on Boardgamenews. I’ll say more later but for now I’d just mention that Best Game Club Site went to…… Trickylight ….. -Â Listens for lower jaw hitting the ground. I’m currently working on an acceptance speech for the glitzy awards ceremony that is bound to follow. 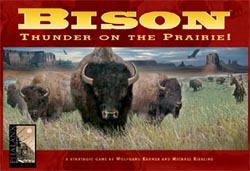 Bison is another Wolfgang Kramer / Michael Kiesling action point game that combines area control with tile placement. It is published by Phalanx in Europe with an English language version from Mayfair. 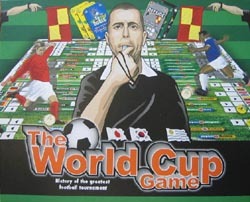 The game is played over a number of seasons (four in a four player game) and the basic goal of the game is to build up your food production capabilities. Food consists of salmon, bison and game birds and each player starts with 10 of each. During each season, food is spent to build up your presence on the plains, mountains and rivers and at the end of the season, you obtain bison, game birds and salmon based on your relative strength compared to other players in each of the respective areas. Each player performs 4 out of 6 possible actions per season, taking one action at a time sequentially, and one of these has to be to place a map tile and add hunters to that tile. The others involve moving hunters around or upgrading hunters to teepees (on land) or canoes (in a river). Players start with a few hunters and low value teepees / canoes but then has to spend food to buy more of these as needed. At the end of the season, scoring takes place. The player with the most influence in each area receives food equal to the number of animals displayed in that area. 2nd place receives half of the total animals in the region, rounded down and others receive only the animals on the tile placed. At the end of the final season, any stocks of food are lost and scoring takes place in the same way after each animal food track has been set to zero. The player with the highest total of food for all three animals is then the winner, with ties broken using the Euphrat and Tigris method. The game was clever and there seemed to be a lot of thought required in terms of the order in which to take actions and when to place your tile. Even though you only had one action at a time, this still led to a fair bit of downtime. Food was very tight and there was a lot of competition for control of the largest areas. We did think, however, that there was a pretty significant advantage in going last in the final round as you were able to knock others down while not then having anybody do the same to you. Nige was able to make a large swing against Mark K that knocked him out of first place in the joint largest region while bringing his own score back towards something more respectable. This enabled Steve to sneak through for the win but then he had been practicing all week. The overall verdict on Bison was that it was ok but not as good as some of Kramer and Kieslingâ€™s other collaborations. 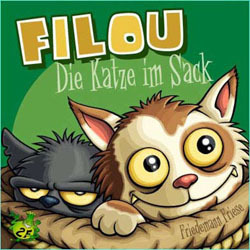 We finished off with a game of Filou (or Felix: The Cat in the Sack), a little card game by Friedemann Friese and published by 2f-Spiele and Rio Grande. This is a bidding and bluffing game that is very simple but is good fun and can be played to completion in less than half an hour. Each player starts with an identical set of 10 cards from which one is removed at random. In each of the nine rounds, all players add one of their cards face down to the sack and the start playerâ€™s card is revealed. Players then bid on the right to acquire all the cards in the sack. If a player passes, they receive a small number of coins and another card is revealed, thus giving more information about the value of the sackâ€™s contents. When only one player remains in play, they pay their bid and receive the cards from the sack. These could be cats of positive or negative value or dogs who chase a cat away before you receive the sack, or rabbits that are worthless. After all cards have been played, the value of cats is added to your remaining coins and the highest total wins. A bit of memory helps in this game towards the end in working out what cards are likely to be left but, as some cards are removed at the start, nothing is certain. Watching how many coins other players have is important especially if you can force them out of a bid due to lack of coins. Steve suffered from this in our game and never was able to recover. A good bluff can be very enjoyable when you know youâ€™ve put rubbish into the sack but just pray youâ€™ve not timed it when everyone has put in rubbish. Nige surprisingly came out on top in this one, although he had no idea how he had won (not that it stopped him from accepting the win). Good fun and a good selection for the end-of-evening slot. The next session of the Shrewsbury Boardgames Club will be on Friday 18th January and will be at John’s house. 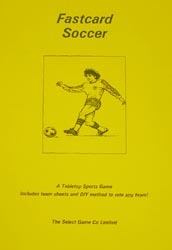 Given how free-flowing the sport it is, soccer is quite difficult to translate to a board/card game and there are few examples of where the game works particularly well. Here are six of the best. Street Soccer is a fabulous implementation of the five a side game. Even though it uses a die to dictate how the ball moves around the pitch, it can be played very tactically with the positioning of players and ball sometimes being critical. 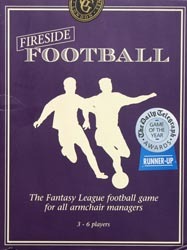 Fireside Football is a card game based on Alan Parrâ€™s play-by-mail game, United, that I played a fair bit of back in pre-email days. This one is more concerned with the managing side with players making team selections and managing their finances. Played in a league format, players also deal with injuries and overseas transfers. Good fun for up to six players. Fastcard Soccer is perhaps more of a simulation than a game using team/player statistics to generate results. However, it is great fun and uses an ingenious commentary system on the cards that makes the game very atmospheric. It also has the attraction of being playable solo. 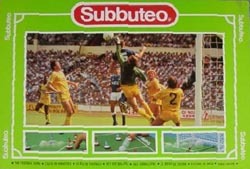 A list of this kind cannot ignore the granddaddy of tabletop football games, Subbuteo. Although Iâ€™ve not played in years, it brings back memories of trying to perfect those swerving flicks â€“ something I never really got the knack of. A skilful game for those with the necessary dexterity to play well. The World Cup Game just edges out the World Cup Tournament Football Game in the nod for the best knockout tournament. Guiding your teams through the group stages and then the knockout is often trickier than it seems, particularly if youâ€™re playing Germany or Brazil as other players automatically target those teams for bad cards. 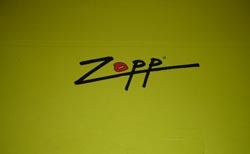 Zopp is my final choice and is another flicking game that is always great fun. The rubberised walls surrounding the playing area and the slick surfaceÂ mean that you can get your players and the ball whizzing around the pitch very satisfyingly and there is always a nice clink sound when the ball hits the back of the net.